The Pacific blob is back, and that could spell bad news for the west coasts of the United States and Canada. That’s because in the past, the blob of warm ocean water has brought with it poor feeding for salmon. It’s been connected to whale deaths and warmer temperatures in western North America. It’s also been connected to a phenomenon California meteorologists dubbed the Ridiculously Resilient Ridge, believed to have played a large role in the drought that plagued the state from 2011 to 2016. Now, Alaska and northwestern Canada are seeing the “son of the Pacific blob,” Armel Castellan of Environment and Climate Change Canada said. Alaska is already seeing unseasonably warm temperatures, and northern British Columbia is still experiencing summer-like weather. 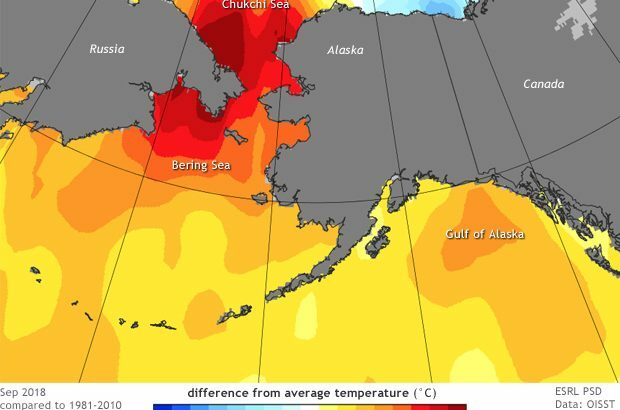 Alaska just ended one of its warmest Septembers in 94 years, according to the National Oceanic and Atmospheric Administration. Parts of southern Italy are experiencing a drought. The Pacific blob of warm water creates a high-pressure period, which changes the direction of the Pacific Jet Stream. That causes warmer weather, and in the case of California’s Ridiculously Resilient Ridge, prevented normal winter storms from making landfall where they’re most needed. Right now, if the Pacific blob fails to dissipate, Alaska, the Pacific Northwest, Montana, northern Wyoming and western North Dakota could see warmer-than-usual temperatures into the winter. A side effect of the Pacific blob seems to be colder and wetter than usual weather in the U.S. Southeast and the Mid-Atlantic states. Phenomena like the Pacific blob are becoming more common, meteorologists say. Image credit: Rick Thoman, based on OISST data from NOAA Earth System Research Lab.